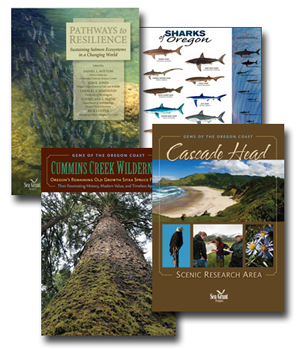 Looking for the perfect gift for the marine science, conservation and recreation lovers on your holiday list? Scientists, fishermen and conservationists alike raving about our newest book, Pathways to Resilience: Sustaining Salmon in a Changing World. This 392-page volume collects 11 essays representing the most-forward thinking about resilience and Pacific salmon collected to date, pointing to new ways we may consider and interact with this iconic fish. Gems of the Oregon Coast: Two short videos explore some of the natural wonders of the Oregon coast – the breathtaking vistas of Cascade Head and the hidden old-growth forest wilderness of Cummins Creek. Sharks of Oregon – a color poster featuring beautiful (and scientifically accurate) illustrations of the 15 species of shark found in the waters off Oregon, from the the sixgill shark, with its electric green eyes, to the sand-loving Pacific angel shark and the notorious Great White. Perfect for a child’s bedroom or a budding marine scientist’s dorm room. For the coastal adventurer, check out the Oregon Coast Access Guide, a richly detailed, 368-page, mile-by-mile guide to to scenic US Highway 101. Travel writer Ken Oberrecht follows the highway from the Columbia River to the California border, telling you where to go, how to get there, and what to expect. For those who enjoy boat-watching, we’ve got Boats of the Oregon Coast, an illustrated, pocket-sized field guide describing the most common commercial fishing vessel types you’ll see offshore or at dockside, including a short history of Oregon’s fisheries. If your family is among the thousands who’ve grown up visiting and loving Visitor Center at OSU’s Hatfield Marine Science Center in Newport, consider a gift that gives to others: Make them part of the gorgeous Glass Quilt Giving Campaign installation in our lobby by purchasing a glass square engraved with their name. Proceeds support our public and marine science education programs at the center. The HMSC Visitor Center Bookstore also has an online store, featuring a selection of their most popular books, clothing and gifts. How about a ball cap featuring our iconic giant Pacific octopus? Browse the sites above for lots more great gifts for those who love the ocean and coast!